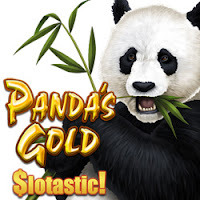 Gamblogger: Get 50 Free Spins on RTG’s New Panda’s Gold Slot at Slotastic! Get 50 Free Spins on RTG’s New Panda’s Gold Slot at Slotastic! Slotastic the new Panda’s Gold slot from Realtime Gaming to its huge collection of online slots. The exotic new game plays 88 paylines for a 50 line bet and has three free spins features with up to 8X payouts. The new Panda’s Gold slot isnow in Slotastic’s online casino for desktop and laptop computers and in its mobile casino starting tomorrow. Slotastic’s free Android App is the most convenient way for mobile casino players to access games on their smartphones or tablets. Until the end of July, get 50 free spins and take advantage of a 150% introductory deposit bonus. Loveable Pandas and colorful birds and animals from the tranquil forests of China spin on the reels of this new game. Scatters start one of three bonus rounds. Three scatters trigger “Prosperity” free spins where Wilds triple payouts. Four scatters initiate “Wealth” free spins with up to 8X payouts. Five scatters begin “Fortune” free games where all prizes are multiplied 5X and winning combinations including a Wild pay 8X. If you've made made a deposit in July you can claim 50 free spins on the new game! Available July 18-31, 2018 only. Available to all players who make a deposit in July.